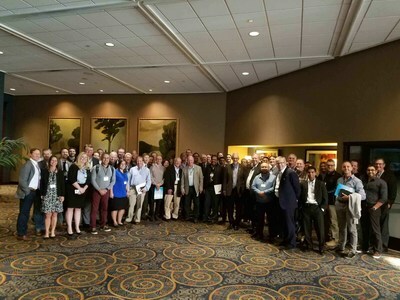 CHARLOTTE, N.C., Oct. 23, 2018 /PRNewswire/ -- SonaCare Medical, the leading developer and manufacturer of high intensity focused ultrasound (HIFU) technologies, hosted over 75 attendees at this year's Sonablate® User Group Meeting, which makes this meeting the most prolific gathering of urologic focal therapy specialists ever in the state of North Carolina. While the attendees of the 3rd Annual Sonablate User Group Meeting are all users and/or supporters of Sonablate prostate ablation technology, the story of this event is much greater than focal HIFU alone. This historic event was a unique gathering of global opinion leaders within the image guided precision diagnostic and ablation space. Attendees like, Professor Mark Emberton from University College London (UCL) and Professor Laurence Klotz from University of Toronto, are urologic thought leaders who are evolving the way medical communities diagnose, treat, and monitor prostate cancer around the globe. With over a decade of experience using Sonablate®, Professor Emberton presented on the evolution of HIFU from whole gland prostate ablation to focal prostate ablation. Professor Emberton, like many of the attendees and presenters, is a true pioneer in the field of HIFU, responsible for many of the clinical advances in the use of Sonablate's focal therapy enabling technology as the most advanced and longstanding HIFU technology used for prostate tissue ablation. As demonstrated in the recently published five-year focal HIFU study following 625 medium to high-risk clinically significant nonmetastatic prostate cancer patients, SonaCare Medical continues to achieve excellent clinical results, supported additionally by the HIFU Evaluation and Assessment of Treatment (HEAT) Registry. Meeting attendees heard more about the HEAT registry from Dr. Stephen Scionti and Dr. Jeffrey Jones. This international HIFU registry is the only one of its kind, containing patient data from both the United States and from around the globe; enrollment is growing exponentially. Sonablate® was the first FDA cleared HIFU device and has now been on the US market for three years, giving Sonablate® users and SonaCare Medical representatives a great deal to celebrate, review, learn, and plan at its annual user group meeting. Among other topics, urologic physicians also presented on: how HIFU compares to alternative ablative technologies; new imaging techniques such as PMSA; mpMRI best practices; unique case presentations; and the pros and cons of active surveillance vs focal therapy. Dr. Mark Carol, CEO of SonaCare Medical states, "As the use of HIFU in the United States has grown since regulatory authorization, so has interest in active participation in a forum where techniques and clinical issues can be discussed openly and positively. The most recent congregation of users and technicians in Charlotte resulted in a wealth of information that will benefit directly patient outcomes. We are so pleased with the support this technology has received from users in the field." Since Sonablate® received FDA clearance on October 09, 2015, more than 2,100 patients have had a Sonablate HIFU prostate procedure across the 70+ locations in the U.S., including top-tier academic institutions in California, Indiana, Oklahoma, Maryland, New York, Arizona, and Texas. Over 70 U.S. physicians now offer HIFU prostate tissue ablation to their patients as a minimally invasive alternative to surgery or radiation, a number that is growing monthly. In addition, Sonablate HIFU prostate treatments are available in more than 50 countries worldwide where Sonablate has been used for close to 20 years.